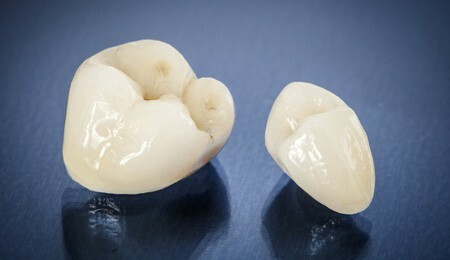 Dental crowns and bridges are tooth prosthetics that replace or restore teeth that have been damaged or are missing. The dentist custom fits your crown or bridge for maximum comfort. The dentist can affix crowns, which are sometimes called “caps,” over the surfaces of natural teeth or dental implants. Bridges fill the gaps left by missing teeth. The dentist anchors a dental bridge to the natural teeth or crowns nearest the empty space. You cannot remove crowns and bridges, as the dentist cements them into place. Patients who restore their smiles with crowns or bridges enjoy both the function and appearance of normal, healthy teeth. The Etruscan civilization is the first recorded society to use crowns as a means of restoring damaged teeth. They used materials like ivory, gold, and bones; these were still the standard in dentistry until the 20th century! Today, crowns and bridges are designed to fit a specific patient’s bite. The dentist can usually be place them in as little as one or two dental visits. With the proper routine of cleaning and dental check-ups, crowns and bridges can even last a lifetime. If you have a damaged or decayed tooth that remains intact, a dental crown may be the treatment you need. If you are missing a tooth, but the gap is surrounded by healthy teeth, your dentist may recommend a dental bridge. Schedule a consultation with our office in Ahwatukee to learn more about crowns or bridges. If you are a candidate for a crown or bridge, the dentist will reduce the surface of your teeth to guarantee a proper fit. 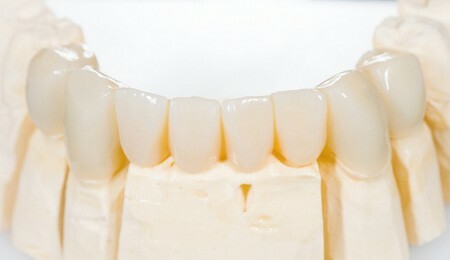 He or she will then take an impression of the patient’s bite in order to create a custom mold for the crown or bridge. If the dentist is using a porcelain prosthesis, the color will match the shade of your natural teeth. If a dental lab builds your crown or bridge, the dentist may provide you with a temporary restoration until the permanent one is ready. Your teeth will need time to heal after the dentist places your crown or bridge. As such, it is normal for patients to experience some sensitivity, especially to hot or cold temperatures. Additionally, you may experience some soreness in the gums near your restorations. Any potential discomfort is usually manageable with ibuprofen and should subside within a few days. If you still have questions about whether Crowns & Bridges are right for you. Give us a call or fill out our contact form to book an appointment. We’re here to help!